Born in Norway, Stein Eriksen was the first Olympic skier to break the Swiss dominion over the modern Winter Olympics by taking the gold in the giant slalom as well as the silver in the slalom when the games were held in Oslo in 1952. Already recognized in Norway, Eriksen’s Olympic achievements of that year turned him into one of the first major superstars of winter sports. He went on to win three gold medals at the 1954 World Championships in Sweden as well as devising several innovative developments in Alpine Skiing. He went on ski programs throughout the United States, finally settling in Deer Valley, Utah where he has served for many years as director of skiing. The internationally recognized Stein Eriksen Lodge at Deer Valley was named in his honor. 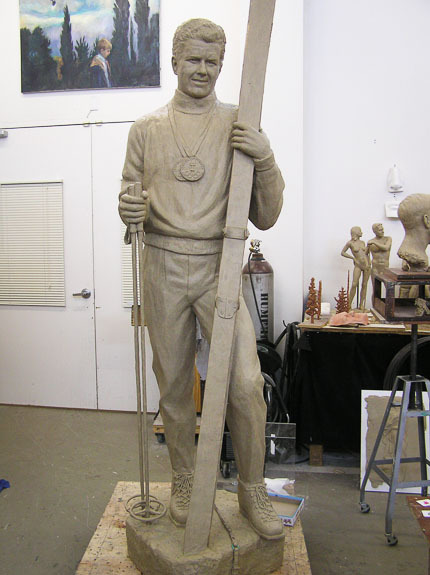 This full-scale figure in bronze of Stein Eriksen was placed in Deer Valley by the many that love and respect him not only for his skiing accomplishments, but also for his great depth of character.